It’s important that you feed your kitty the same food that’s been used by the breeder or previous owner, as sudden changes in diet can lead to upset tummies. You can change their diet over time if you wish to do so, but this shouldn’t happen until the kitten/cat is completely settled into their new home, and it should take place very gradually. You should add small amounts of the new food into the old, gradually increasing the amount of new and decreasing the old in order to minimise possible problems and allow your kitty’s tummy to adjust. Always have plenty of fresh water available and don’t be surprised if your Bengal wants to play with it! A lot of cats don’t like to have water right next to their food so if you can have it in different place (ideally in two or even three places if you have more than one cat), that’s better. A lot of Bengals will enjoy drinking from unusual places such as taps/faucets and even the bath tub or shower when you’re in there! A drinking fountain is ideal if you can accommodate one, the fresh flowing water encourages many cats to drink which is always a good thing. There’s no need to give your cat/kitten milk if they’re fed a complete, balanced diet. If you want to give it as a treat now and again, make sure you buy the milk that’s been formulated especially for cats/kittens (you’ll find it in pet stores, or in the pet food aisle in the supermarket) – some cats are intolerant of the high levels of lactose which are found in cow’s milk and can get an upset tummy if they drink it. It’s also ideal to use the same kitty litter that your breeder or previous owner used, at least for the first few weeks to minimise the risks of any accidents from happening. If you want to change the litter substance, again do it over time and make gradual changes. You should expect, however, that your fur baby will be quite daunted by their new surroundings at first so if any accidents do happen do not chastise them or shout at them, this will only stress them more as they won’t understand why this big scary human is being so horrible to them! Just clean the area and perhaps show them the tray if you caught them soon after the act. Never rub their noses in it – this is a barbaric old wives’ tale which is pure animal cruelty and achieves nothing, other than a stressed and frightened cat. The litter tray should be placed in a quiet location, away from the cat’s food. We are fastidious, and don’t like to eat where we poop! 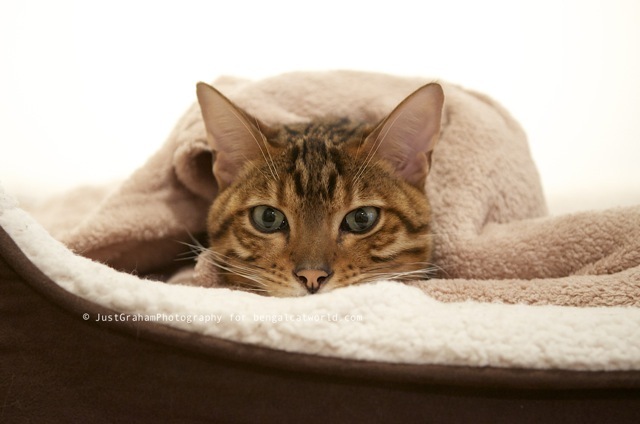 If you have more than one cat, make sure you have enough litter trays – Bengals can be quite fussy about their toileting and may not use a tray that isn’t 100% spotless! You need to scoop out the waste several times a day – this will reduce the risk of your Bengal going to the toilet where they shouldn’t. Should you let your kitty outdoors when s/he is old enough? i.e. when they’ve had all their vaccinations and been neutered? Us Bengals in particular love the freedom of the outdoors and the fresh air in our fur and being outside is one way to satisfy our need for stimulation and to stop us from getting bored… But we’re also adventurous and could well wander further than most other cats, and we also don’t think anything of wandering into our neighbours’ houses or outbuildings if the door has conveniently been left open for us! Cat flap. Do you want one? If so, then consider a microchip operated one. These stop other cats coming into your house, which can be a very stressful experience for your cat, leading to undesirable behaviour (typically inappropriate toileting, or uncharacteristic aggression). If you do allow your cat access outdoors via a cat-flap, we recommend locking it at night and keeping your kitty safe inside. We’ve never really understood the old adage of “putting the cat out at night”! Hopefully your cat will never get ill, but you do need to bear in mind that vet fees can be expensive, and your cat will need to have annual boosters and check-ups as a minimum (these aren’t covered by insurance, though they are usually a requirement of the insurance policy terms and conditions). Ask friends or neighbours for recommendations in choosing a vet if you don’t already have one, ideally they should be near-by to reduce the amount of stress caused by travelling there and back. When first bringing your kitten home remember that they think hidey holes are great! It’s good to have hidey holes for them to play in…except for gaps round the washing machine, fridge etc. Have a look around your home, especially the kitchen, and make sure there’s nowhere that tiny paws can get themselves into tricky situations. Also consider the wires around your home. Tiny teeth are very sharp you can get cable guards to avoid kitty getting a nasty shock! When doing your laundry always check and double check that your kitty has not crept into the opening of the washer or dryer when you weren’t looking – make sure they’re not inside before you close the door and switch on the machine, we’ve heard of tragic instances where kittens/cats have unfortunately been injured or even killed accidentally in this way. Cats like dark corners, and Bengals in particular love high places. You can provide safe dark corners by having ‘igloo’ type beds, or even cardboard boxes (which we love). See if you can provide a few high places for kitty to sit and survey his/her kingdom. A couple of gaps on bookshelves, for example, or you can buy large cat trees at quite reasonable prices. Always look up when you live with a Bengal as it’s not unusual to see us sitting on the top of a door frame and surprising our humans with a friendly paw on their head! I love playing with my feathers! Play with your cat every day. Play with toys, not your hands as you shouldn’t condition your cat to believe your hands and feet are targets. We’ve found that fishing-rod-type toys are a firm favourite for Bengals! These should always be used under supervision and placed safely out of your kitty’s reach when not in use. But try several toys to see which are your cat’s favourite and rotate them to keep it interesting! It’s worth giving early consideration to what will happen when you go on holiday: do you have someone you can depend on to come in and feed? Would you rather employ a professional pet-sitter, or use a cattery? Consider the possible costs now, rather than be taken by surprise later. Remember that popular, well run catteries fill up quickly for peak holiday seasons such as Christmas, Easter and summer, so you need to book well in advance. Again ask friends or neighbours for recommendations for a good cattery or pet-sitter. Do you have other pets? If so, the new kitten will have to be introduced in a controlled and gradual manner in order to have the best chance of a friendly relationship (see our article on introducing your existing cat). Same with children, actually! Your new kitten will want to sleep as much as 18 hours a day, so children should be encouraged to play at play time, and leave kitty alone when he’s/she’s sleeping. Talking of sleeping, cats can be quite strange sometimes and will sleep in all sorts of weird and wonderful places, though often not the expensive bed you’ve bought them! But having said that, some cats do like a nice, comfy cat bed… We would recommend that you start off by buying perhaps a less expensive bed, or even providing a cardboard box with some snuggly bedding inside! If your cat seems to like sleeping in these places, you may wish to consider upgrading to a more fancy cat bed, but if they decide the top of the kitchen cabinet is much more their cup of tea, then you haven’t wasted too much of your hard-earned cash! Even a short haired cat like a Bengal needs a weekly groom to keep our fantastic coats in tip-top condition! Get your kitten used to grooming as soon as possible. Keep it gentle and light, though don’t encourage playing with the grooming brush! Bribery is fine. A couple of treats can make the whole thing more pleasant for everyone! Also, check ears, eyes and nose and clean gently with a cotton wool pad soaked in warm water at the same time as grooming – get your kitty used to this at a young age and it will save problems later. You may also wish to give consideration to whether or not you want to trim your kitty’s claws. This isn’t harmful if done correctly, it’s just like humans trimming their nails, but again if you’re going to do it, it’s best to start at a young age to get your cat used to it. For information, we do not agree with declawing a cat. It is illegal in many countries for very good reasons. If you don’t like cat claws, then a cat is not for you. Simples. 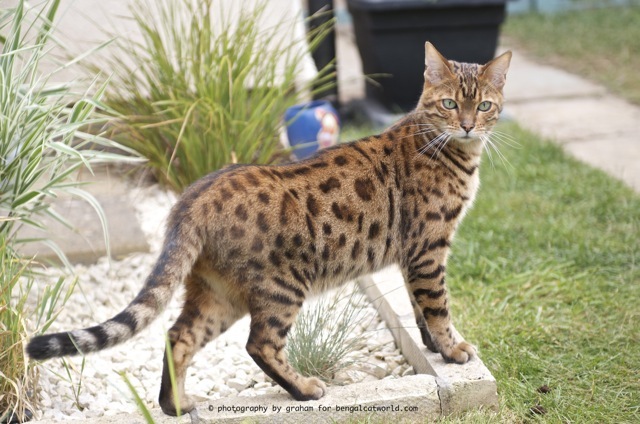 Showing – if you’re thinking about showing your Bengal, you’ll find a handy guide we’ve written just here! Hi. I am a Bengal owner. Such an amazing breed. I was wondering what puzzles you’d recommend? I bought a treat ball. I would love to have other options for my Bengal as well. I have a new Bengal kitten (about 1 year) and I am searching for ways to keep him busy, especially when I am out of the house. I usually leave the fishing rod toys out when we are not playing with them. Is this a bad idea? So here’s the thing. I got a new kitten and he’s about 3 months old. He was separated from his family and he’s been crying from the morning..he hides himself in the corner of my dresser and cries. I tried taking him out and holding his but he still cries. Touch him he cries. Leave him alone he cries. What should i do about this ? We’re making sure he has his food and water next his box where he can see it but seems like he isnt eating properly. He’s new to the house but the crying….How can we make him stop and get used to the house fast ?? Hi I had the same problem. I warmed kitten milk and dipped my finger in she started lapping the milk of my finger. After a while I started with a little wet kitten food. When she had a taste and saw the bowl she came out. I also put my scarf next to her to get her used to my smell. She is all happy and settled now. Good luck. We just brought our bengal cat home two nights ago.. She will be 12 weeks soon, we did everything how the breeder told us when she came home.. She has been excessively meowing to the point where we cannot sleep, and we cannot get her to stop even if we ignore her. She sleeps in the living room and is good for most of the night but around 5-6 am she wakes up and will NOT stop meowing no matter what we do. Is there any tips to get her to quiet down or meow a little less.. We live in an apartment and are worried about our neighbours. Hello! I’m sorry she is being a bit loud. Does she have everything she need in the living room? Food, water, litter tray? Has her food run out by 5am? Or is her litter tray used? If the answer is yes to either of those questions, we would suggest putting more food down before you got to bed, and maybe adding another litter tray, even if it’s just for the overnight period. Bengals are extremely vocal animals, sometimes for no reason at all! This is why it is always very important to get all of the information you can on a breed of animal before taking them in. My Bengal used to meow about 6am every morning too when we first got her. We were allowing her the hall way and living room at nights, one night we left our bedroom door open to see if she would rather be with us which she did, she now sleeps with us all night on the bed and doesn’t meow at 6am any more! My bengal loves to meow at the top of her lungs at about 6 every morning 🙂 lol She’s just vocal and usually if I meow back at her, she’ll come find me and be okay. I honestly believe she thinks she is alone and when I meow back she knows someone is there and she’s okay. That’s how our bengal is when he thinks he is alone, because he saw one of us leave or we have been too quiet at night. Whoever is home, or has been wakened by his loud call, calls his name or makes a sound. He reaponds immediately and settles, or plays, near-by. He usually has the same call when he is lonely that differs from other calls/sounds he makes. They do not like to be alone especially at night! They like to sleep next to you! How did u train the Bengal? 🙁 This made me think harder about whether or not my family is kitty ready. I wanted to be. Not just yet but when we are, this is definitely the breed for us! I was thinking about getting the home cat ready first then getting the cat. First thought was the wall shelving, so that the cat can use it as a kitty stairway. Hi Claire! Some people who are allergic find they don’t react to Bengals, but we’ve heard of others that do. So you probably won’t know for sure until your brother comes into contact with him. Hello Dawn. It certainly sounds like he is unhappy at being left alone, and no wonder considering his past. Is there any way you could have a family member or trusted friend come and actually stay in your house while you are away rather than have a cat sitter who only comes in a couple of times a day? Or…. and this is a bit more radical…. how do you think he would cope with another kitty friend? Bengals are usually quite sociable cats and love to have a playmate! (doesn’t have to be another Bengal, but needs to be quite a lively cat). This may ease any feelings of being left alone. Food for thought maybe? I need help! I have had my bengal kitten a week and he is excessively meowing! He is 9 weeks old. He screams when he’s not with us but still meows when he is with us. To prevent accidents and get him used to his litter box he is in a very large bathroom. I have litter box on one side of the room and food and water on the other side. He still has accidents though when taken out of the room and I’m wondering if he just doesn’t like using the litter box in there. He tries to claw his way out of the bathroom..so much so it caused his nail beds to bleed. I’m so unsure what to do. And when in the bathroom he SCREAMS for a good 20-30 minutes til he gives up. Should I put his litter box in a completely new room? Will giving him free roam stop him from meowing all the time? Hello Lisa. He was very young to be with his new family, most registered breeders don’t usually let their kittens go until they are 12 or 13 weeks old, after they have had their injections. He is having separation anxiety issues – he has been separated from his mother and his litter mates and is confused. In terms of the litter box issue, young kittens have very small bladders and often when they need to go, they need to go! So if he has a larger area to explore, you will need to have one or two more litter boxes available for him in different parts of the home. This way you can give him more access too, and allow him to free roam. I guess there’s not much fun in a bathroom for a young kitten – they need lots of toys to play with and things like cat trees to climb on, windows to look out of and generally learn about their surroundings. He also needs a nice comfy bed to sleep in, even if it’s just a box with a comfy cushion in it! Cats just love boxes. It sounds like he needs lots more reassurance and interaction and play time. Good luck! My kitten is 3/4 Bengal and is 8 weeks old and we have had him for 2 weeks already! He was quiet at first and would regularly sit on on my shoulder purring and being extremely lovely and affectionate ! The last few days he has been really naughty he now only gives affection sometimes he just wants to play constantly ! He has loads of toys but his favourite is the rod toy. He was taken from his mother much too soon at 6 weeks and now needs the attention he would have had from her and his brothers / sisters (if he had any) from you. You need to give him lots of attention as you are. If he does very naughty things, it’s only a way for him to get your attention, so you need to say ‘no’ in a firm, but not shouting voice, and then ignore him for a few minutes. He should soon learn that bad behaviour does not get attention. Never shout at him or tell him off as he’s only being a kitten. I’m sure he’ll settle in time. The excessive meow-ing seems to be unherent in the breed. I have 2 rescue Bengal mix cats who are now 3 years old. The girl cat is an excessive talker. She wails at the top of her lungs at 5am. This behavior does not happen every morning, but enough to be exhausted by it. Their story sounds so similar to those I have read on this thread. Yes, many Bengals are very vocal, Marg. I have a 1 year old Bengal and his behaviour is becoming more strange. I know that they can be very destructive and I’ve been handling that pretty well. I know he’s destructive when he’s hungry or wants to play. We have lots of toys for him to play fetch or piggy in the middle with. We have the toys on a rod as well. He has a large climbing-resting frame for him and my other cat and it has toys etc. The problem is that he is a very picky eater and getting fussier. I put food out for him and he will eat for a day or so at most and then he doesn’t want to eat it. He’s on a raw diet and has been since he was a baby and he’s always loved it. I then have to get something else for him to eat and we noticed that we have to change what he eats constantly, but it’s always raw. However, when we have only a few varieties in the house and he doesn’t want to eat any of them, he becomes extremely destructive. He chews the wires in the house, tears at my speakers, trying to knock paintings off the wall and so on. It doesn’t matter how I try to distract him, he will then go right back to the thing he was destroying. He’s extremely single-minded and you can try and distract as much as you like but he will go back to what he was focussed on, no matter what. I have tried everything, even giving him cooked meat, and worst of all tinned food (as a desperate last resort), but he’s exactly the same with those and tinned food is disgusting and only causes diarrhoea, so that’s a no-go. I’m at my wits end and don’t know what to do. He’s healthy, has no toilet issues, and isn’t vomiting. He’s just becoming extremely fussy and, in the process, very destructive. Hello Heather. Sorry to hear you are having problems. You say that he is like this when you have only a few varieties in the house. Is it possible to figure out what his favourite one or two are and make sure you always have plenty of supplies of those? Also, I would feed him in a room with the door shut and not let him out until he eats something. That might sound harsh, but each time he doesn’t get his own way, he is being destructive to get attention and by giving him different foods you are giving him that attention and therefore increasing his fussiness. If he doesn’t get any attention, he will soon learn that it gets him nowhere and so this behaviour should reduce and he should learn to eat the food that is available. I take it he is neutered? If not, perhaps you should consider this as it may help to calm him a little. I have tried the favourite food trick but then he starts turning his nose up at that. I do think perhaps locking him in may work, although that’s trickier with my other cat around. Otherwise he is an adorable cat and I love him to bits precisely because of his playful nature and his single mindedness. There’s no way I would part with him but he is more than a little frustrating. I will try putting him in the bathroom to see how that works. I will update you of his progress. Thank you! OK, so this was the first attempt. Try again tomorrow. It’s bound to take some time, but he should get the message and hopefully sooner rather than later. Thanks for the update, Heather. I should have said, he is neutered. It didn’t calm him a single bit! Hi I have been researching this breed intensely. My husband is allergic to cats and our last cat had to live outside because of it. Recently I found out about certain breeds that he may be able to tolerate and I have fallen for bengals. We have been to see a lovely breeder where we spent over an hour, she has 8 adults and when we visited she had 2 litters aged 4 and 5 weeks old. My husband tolerated them all quite well, he wasn’t too sneezy and chesty at all. I have two questions: 1. We are invited to go back and visit again whilst the kittens are still there – do you think this will be enough to decide if it is safe for us to get a Bengal? And 2. If he is allergic to cats would you say if the results we had when he was in contact with 8 cats plus kittens his reactions were mild, they would be even less if we had one cat of our own? I would appreciate any feedback, thank you! Hi Geetna! Bengals are quite different to other breeds in many respects: they are much more active than some other breeds and needs lots of playtime and interaction/stimulation. If they get bored, they can be quite naughty and destructive. They are highly intelligent so can learn how to open doors and cupboards. There is quite a lot of info on here you can look at and on other sites too 🙂 We recommend you do your research very thoroughly before deciding if one is for you or not. All the best! You have to try and relax, Rimi as s/he will pick up on your fears. There is nothing for you to be scared of, but just take your time and do things slowly until you are both accustomed to each other. Good Luck. I am writing to ask for help. We have a 4 year old Bengal named Simon and we love him very much. The problem is that he is extremely loud during the night. It seems like the moment we go to bed, he comes to life and howls and cries all night long. We try to play with him during the day and evening, but he acts like he is bored. We have a bengal wheel that Simon runs on, and it seems like we own just about every cat toy possible. He will play with a toy one day and ignore it the next. We literally spend hours every afternoon and evening trying to entice him to play, but most of the time, it doesn’t work. He has a ton of energy, but it seems like a game to him to watch us go through his toys trying to find one he will play with. We have another cat, but that cat is not a Bengal and is not as active as Simon. They play together sometimes, but Simon has a lot more energy than the other cat. We do not get up during the night to play with Simon because we don’t want to train him into thinking we will keep doing it. However, it’s been 4 loooong years and he STILL hasn’t learned that he needs to sleep during the night. Can you please tell us how to train Simon to sleep during the night? Please do not simply say to play with him because we can’t get him to do that on a consistent basis. We would love to know how to get him to play because we think that would help him sleep at night, but he will not play with the same toys day after day. We even hide toys and bring them out like they are new, but it doesn’t work. We are very appreciative for any help that you can offer! Hi Tara! Where does Simon sleep? Does he have the run of the house but perhaps with the exception of your bedroom? If so, we would recommend that he is confined to just one or two rooms that are not adjoining your room. Make sure of course he has all the things he needs such as water, litter box etc. In the short term, he may make even more noise, but continue to ignore it. If he is removed from you and can’t hear you in the night time, he should quieten down. Also make sure he is unable to see outdoors by ensuring curtains/blinds are closed in the room(s) he is in. Cats are naturally nocturnal and if he can see outdoors, he might be yearning to go out hunting. Finally, this might sound silly, but you could try buying him a reasonably large soft toy that he can cuddle and be friends with and sleep with at night time. I know that sounds odd, but it has worked for others. We hope that helps. I am writing to ask if it is normal for a 8 week bengal to be meowing when he is in the litter box. He meows while he digs and when he pees (only once or twice when he pooped). Sometimes he lets out a longer deeper meow (kind of like “mrawww”). He also makes that low meow when he eats his kibble sometimes. Hi Tom! It’s not ‘normal’ for any cat to do this, though if he has been used to sharing the litter box (and food) with his siblings before he lived with you, then it might be an explanation. If you think he is in pain when he is passing water, I would take him to the vet to get checked out. He will be due his first set of vaccinations soon anyway, I would imagine. Hopefully, it’s nothing serious, but it doesn’t harm to get it checked out. I have a 3 year old, rehomed Bengal. I know that when any animal is rehomed, they can have stress. Reading some of these comments I realize some things that I am doing wrong. Like at night I leave the blinds up so she can look outside… but if I don’t, I’m afraid she will destroy the blinds. She does great during the day, we play with her and she will cuddle next to us… a couple hours before we go to bed we will keep her up with us and have a pretty great play session (she is so cute when she is jumping around)to wear her out that way she sleeps through the night. Instead she finds the stored energy in her system and she will meow all through the night. First it would start at midnight and end at 3 AM. Last night it started and didn’t stop until it was basically daylight outside. I ordered her a thunder shirt to help with her stress. It worked for my dog back home, so I am hoping it works for her too. They say that you know what is going on with your cat by their meows, well her meows are not consistent, but I would guess they are more a cry for attention or for her last family. Which I know they will come over and visit, because I use to pet sit for them. How can I make the transition easier for her? Should I buy her more toys, I read on an earlier post to buy her something fuzzy to cuddle next to. She will fall asleep with the light on and I remember that the house she lived in there were night lights. She grew up with another cat, but I cannot afford another cat at the moment. Is this just something that takes time, if so how much time? I love sleep just as much as she does. I love her and Amira has my heart, but I need help understanding what is going on with her. I rehomed a stray when I was younger and she was a humble cat, never made a peep… I know this is a different breed, but any animal is chatty when they want to be. Thank you & I hope to hear from you really soon, like in the next hour. Hello Lexi! We are sorry we didn’t reply within the hour as you wished, but we are not online monitoring comments 24/7 🙂 You don’t mention how long you have had her for? Of course every cat is different and different cats take different amounts of time to settle, so it’s impossible to give timescales on these things. It sounds like she is a fairly recent addition to your home, though, so it’s almost certainly separation anxiety from her previous family and home that’s causing these issues. I’m not sure that seeing her previous family would be a good thing, particularly whilst she isn’t yet settled at your place, as this could confuse her and mean that it will prolong the settling in time with you. It’s a good idea to buy a cuddly toy, many Bengals seem to make friends with them in the same way that children do, worth a shot at least. If she has plenty of toys, then you probably don’t need to buy more, but if she only has a few then it wouldn’t be a bad idea to do so. Hi, we are about to adopt a 4 year old Bengal. We will be able to have all her existing toys, bedding etc. to help her adjust to our home. My only concern is we also have a 10 year old toy poodle. I would appreciate your advice on how best to introduce the two. My dog is well used to cats and other animals, but I want to make this a positive transition for both animals. Hi. We’re getting a half Bengal half Tabby kitten tonight. I’m a bit worried about if she scratches a desk or a dresser or something as this could ruin the furniture and as I’m a teenager my parents wont be very happy! Any suggestions? My name is Kyle Furlow and I have a Siamese named yogi and a black cat named boo boo and they are brothers and are 4 years old, and I have a beautiful male Bengal named cash. I’m posting this for a little advice for Bengal owners and people thinking about getting a Bengal. Please take into advice that bringing a Bengal into a home or bringing another pet into the home will take some time for both animals to adjust, I agree with everything that the helpers on this sight are saying, read what they haft to say very carefully and you will be happy as well as your furry friend. Bengals are very hyper and ready to play at any time, I teaches mine to ride in my vehhicle without caging him. He loves to ride and go places, this can be taught at a young age. They learn like dogs do, I keep food, water and a small bedding and a small litter box in my truck for him. Bengals thrive for attition when they want it no matter what time of day or night. DO YOUR HOMEWORK BEFORE GETTING ONE!!!!! They are great pets and awesome friends for your home. I PROMISE you won’t get bored!!!! I’ve raised 12 different breeds of cats and the Bengal by far tips them all. I guess I am just looking for peace of mind. I bought a Bengal kitten last week and he is great. he has finally stopped meowing all night and now only has little episodes. What worries me is that he doesn’t like toys. He is actually scared of them. He comes up to people and absolutely LOVES to be petted and stroked and kissed, but he won’t cuddle at night and he just plain old doesn’t play. He will run to a mouse if you throw it, and then when it doesn’t move again he refuses to hit it with his paw. He watches the fishing rod toys but if it gets to close he runs away from it. I work all day, and I havn’t had issues with him its just I am terrified he has got to be bored, and I don’t want him to be unhappy. Is it normal for some bengals to be this mellow? I agree to what spot the Bengal said. I’ve never seen any kind of breed that doesn’t like toys. But your baby still could be getting used to his surroundings. It took mine a month and half to get fully settled. But I had to bring him it to two other cats in my home that are two years older than my boy. I take my boy out for a walk every afternoon up and down my street. I’ve done this since he was a kitten and he is 3 now. I have noticed it helps a lot and gets him worn out which makes him sleep with me all night. Back to the toy issue, there are more cat toys out there than toys for kids. I have a huge verity of toys for my critter. All of the rod toys I keep put up until play time, doing this keeps him interested in the toy and he doesn’t get burned out on it. My boy likes to jump in the air after the rod toys. Keep trying different things and see what he is interested in. You are in a great position with your Bengal being a kitten, getting your boy to ride in your vehicle. I taught mine when I picked him up from the breeder and he loves it, he gets up in the window and looks out at everything. I take mine on road trips and vacations. He always is turning heads when people see him looking out the window when I stop at a stop light or I pull in a gas station. If you are like me you want your boy to go with you when you leave home for a vacation. You need to find a cat tower next, that is a must have for a Bengal. Try to find the tallest one you can find because bengals love to climb and be up high. I have one that is 7 foot tall, but I just bought another one that is a little over ten foot. Other than that have fun with your new addition to your family. I have a kitty that I strongly suspect is either all or mostly Bengal. She was a rescue. We just lucked into her. I adopted her because my friend was moving and was going to take her to the pound 🙁 She has the silky fur, the glittery bright silver marble coloring, spotted underbelly, love of water (she slaps the water out of her dish, “kills” her toys in it, and even jumps in the bathtub and rolls around in the water after our showers). We love her playful and friendly nature (although she is a bit clumsy), and we love her “chattiness”-most of the time. She will follow me from room-to-room “talking” to me in the form of little chirps and chirrups and it’s just lovely. The girl I got her from told me when she was naughty that she put her in her carrier and covered it with a blanket so she couldn’t see outside. I did try this (feeling like an abusive mother the whole time). She instantly quit yowling and was silent the whole time, but she resumed the minute I took her out and I can’t bear to leave her confined like that all night long. I can’t imagine this is good for her, or am I wrong? Is she quiet because the dark and close quarters are comforting to her, or because she’s scared and hurt? She didn’t act stressed or upset when she came out, but she definitely did not want to go inside. If this is not harmful to her, I may consider trying a bigger cage. I’m dying for a good night’s sleep. I’m about to lose my mind and my job, but I love this little girl and I don’t want to harm her, either. Thoughts? A cage sounds awful to us humans, but to a cat if it is warm and comfortable and has all the amenities she needs such as water, litter tray and food (if needed), then she will probably just sleep all night and not think anything of it. It may well be that if you try it for a few days, it may get her out of her yowling habit. If she was scared and hurt, you would be able to tell that, but it sounds like she wasn’t. I’m not a fan of cages, I let my Bengal out side and I’ve noticed that helps with the talking. There is things you can buy to section off your back yard to make a area for your critter, if you don’t want your critter to completely run free like mine does. Mine loves to roam in the woods behind my house and chase chipmunks, birds, lizards, snakes, and so on. I’ve also noticed when I’m away all day my critter is very vocal when I get home. So what I do is I take him out for a walk around my neighbor hood. That usually wear him down and make him less vocal and he will sleep through the night. Try it out and see if it helps. We live in a city-type area that’s not safe to leave her out unless she is completely supervised. There is too much traffic, neighbor dogs, etc. My neighbor has a boxer and a pit and Olive is terrified of them and the noise they make-as well as traffic and the sounds cars make. We do have a yard and have considered a run-but I’m afraid that if a dog or something caught interest in her she wouldn’t be safe-especially since the neighbor’s dogs have the potential to be vicious. We are planning on getting her a harness to maybe try leash training as a sort of compromise. Hoping to maybe accomplish that this weekend. So if she seems fairly happy when she leaves the cage, then she is likely ok with it? She seems sleepy when she leaves it, but not upset. I think she likes the small space and the darkness. I would definitely need a bigger cage, though, because there’s not enough room for litter in the one we have (it’s just a carrier). Thank you so much for your help and feedback. I’ve always had cats, but my last furbaby was a fat male tabby and he went along with everything, never got into trouble, and he couldn’t even meow! You can imagine what a change this is for us, but we are so charmed by Olive and her funny little ways! Try the cage for a while and see how it goes as she doesn’t sound upset. You could also give her access to it as a sleeping area during the daytime with the door open so she sees it as somewhere warm and cosy. After a few days, maybe at night time you could leave the door open too and let her sleep in there like that. Good luck! OK, thank you for your help 🙂 she’s actually going in on her own now, but only when I set her down in front of it. We need to get her a bigger cage so we can fit a litterbox inside and she can have that space all night, instead of just an hour or two at a time. We’re very excited to try walking on the leash, I’m hoping that will help, as she seems to have gotten bored with toy play. My little girl is 2 and a bit and i have had her since she was 18 months old. I have a feeling she wasn’t properly interacted with as a kitten as she is quite distrustful of humans and still runs away from me and cowers if i move too quickly. She isn’t food orientated either but i have found some treats (freeze dried chicken) that she likes. she has gotten bored of all of her toys and now any new ones i buy her she isn’t really interested in. I love playing with her but don’t know what to do now as she won’t play with anything. She goes out hunting all night and does come in to sleep, i live on a farm so she has plenty of fields to run through. She isn’t noisy at night anymore either so i know she is happy. I just feel like she isn’t really getting a lot of interaction with me. Is she too old to leash train and if not what would you suggest is the best way to go about it? This is Kyle and my Bengal Cash, I gotta say living on a farm gives your girl a lot of room to play. I feed my boy raw meat along with iams natural dry cat food. My boy rather have raw meat instead of the dry food, I usually feed mine deer meat, duck, squirrel, rabbit, and dove meat. I would try approaching her different than you have been in the past, and try spending more time with her inside. I use real squirrel skins as toys, my boy loves them, I tie them to a fishing poll and get him in the front yard or my back yard and he chases them around like crazy. I would also try tennis balls, cut a little slit in it and put a jingle bell in there, that way she will hear it in your hand. As far as pole or rod toys with a string, I usually keep those put up until play time, that keeps them interested in them. Spot the Bengal will have some good info to when she replys to you as well, good luck. My mum whose in her late sixties has taken on an 8 yr old half Bengal cat, she has had her just over a year and a half. She provided playful toys and tried to interact with her everyday. The Cat (Chloe) isn’t interested in toys which is strange. She also isn’t keen on being picked up and cuddled or being stroked on her back end. Mum’s had her to the vets from day one and physically she is fine. We are aware that Bengal cats are vocal but Chloe is constant day and night, mum will never give up on her. We know very little of her past but we think she may have had a litter at some point and they were taken away from her too soon. Do you have any suggestions of anything we could try that would help Chloe, maybe we have provided the wrong toys. ❓ Hello, I am rescuing a sick little Bengal girl about 8-9 months old. She was diagnosed with Crytosporiduim back in July and her previous owners have neglected to treat her properly. I am prepared to have my hands full. The original owner/breeder suggests I keep her crated until her medication has ran its course, probably about 3 weeks. She also has potty issues as the first family had 3 small children that mauled her so it could be related to stress or a UTI. I plan on bringing her to the vet within a month or two to verify the parasite is gone and ensure that no UTI is present. Her current foster has her running around the house and she occasionally uses the litter box and the other time will go in the foster mom’s bed. I bought some Feliway to hopefully destress her and make this transition as easy as possible. I bought earthborn grain free food and some probiotic so mix in. There was some mention of a “raw diet” but the current foster insists that it made her bowels worse and does not currently have her on it. I will gradually transition her current food with the food that I purchased but was curious on your thoughts about the raw food or exactly what it is. Any and all advice is greatly appreciated, thank you!!! Hello Tiffany. Thank you for taking such care over this girl, we hope she recovers soon. 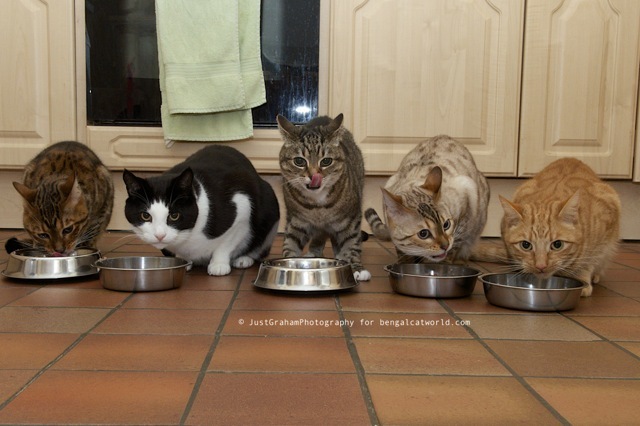 A Raw Diet is exactly as it sounds – raw meat that is provided to the cat for them to eat. You can buy it commercially – the manufacturers ensure all the correct vitamins and minerals required by a cat are present, or you can prepare your own though it’s not as straightforward as just giving your cat a raw steak or piece of chicken. Many people favour raw as it is seen as a more natural diet without the additives that most non-raw commercial pet foods have. We personally have not fed a raw diet to any of our cats, so we are not experts in it, but there are quite a few groups on Facebook where you can seek advice. We wish you the best of luck with your new girl and hope she makes a speedy recovery. I rehomed what I soon found out to be a Bengal kitten, 8 months old. VERY different from other cats. She too had been in a home with young children who fought over her and who had tugged at her a lot and even dressed her up in doll clothes to the point that the Mom said she went and hid as soon as she heard the kids come home from school. I was upset that she wasn’t the loving lap cat my previous sweetheart had been but I just decided to leave it all up to her and set about trying to understand her personality. At first she would be in the same room as I was, mostly, but waaaaaaaay across on the other side. I so wanted her to sit on my lap, but just let her be and even acted like I was ignoring her. I wasn’t, but she thought I was. I did make a point of picking her up and slinging her over my shoulder at least once a day, most often taking her to the window when the birds were coming home to roost, but made a point of letting her down immediately as soon as she fussed, figuring that she not only had the Bengal personality but also had been traumatized by the children . Now seconds have stretched into minutes at a time. She didn’t like being petted at first either and that made me sad but I followed the same protocol….just let her be. The more I did that, the more she trusted me and initiated her own kind of play and demand for affection. At 8 months old when I took her in, she wasn’t at all interested in kitty treats, which really surprised me. Now at 14 months she will open her mouth and take them out of my fingers one by one and has learned the word “cookie” and comes running. She even demands a good head scratch before settling down to sleep with me. At first she slept way over on the other side of the king-sized bed, at the foot. just about as far away from me as possible. ….still, she cried if shut out of the bedroom, so I figured it was going to be a process. There have been several times now that I’ve been the recipient of vigorous head butting and a full facial exfoliation followed by fur buffing in the middle of the night, way more affection than she shows when I’m awake, and just in the last couple of weeks she’s curled up next to my feet and even sat on my lap in bed for brief moments. Do I like the full facial licking while I’m asleep ? Why no, au contraire, but I didn’t discourage it at first because she was initiating trust. Now I can just throw my arm over my face and keep on sleeping and she stops and curls up beside me instead…..always moving to a more distant location before morning. She’s not fooling ME though. She’s more of a softy than she wants me to think she is. The more I play with her…..which she now demands by running in and tapping me on the leg or shoulder while I’m sitting at my desk, then running into the bedroom where she prefers to play on the rug, like “Come ON, let’s go play !” ……the better and more affectionate a companion she becomes. She’ll keep doing that until I capitulate and go in there with her and drag out her catnip mouse or a chase toy. I particularly try to wear her out with a fishing rod toy before going to sleep, and if I do then she’ll pretty much sleep through the night. Feeding her right before I want to go to sleep helps too. She does get “chewy” as others have described, but she’s young yet and is learning. I never yell at her but if she’s gotten over-stimulated while playing and her eyes get dilated, I can tell she’s going to go for me, I really have to pay attention, because she’s fierce and can draw blood. I’ve found quickly subbing in a catnip mouse will draw her away from my arm and give her something to kick and chew on, and also as she’s gotten older she’s learning signs and words, or I grab her by the scruff of her neck and haul her into my lap and hold her there like her mommy would do. As she’s gotten older I can hold up my hand, palm facing her and fingers spread, and firmly say NO….but never yell or swat her. She’s getting pretty good at responding to that but if it fails, I give her a real deep animal growl and look her straight in the eyes until she looks away. Yep, works. I swear I’ve never had to work this hard at animal behavior…..all my other pets were perfectly behaved and loved me from the get-go…. but she’s worth it and I’m not a believer of “returning to the store….or shelter” as though the animal is merchandise. Her name is Harley, after the motorcycle she resembles as she tears around the house. Love your Bengal, you won’t be sorry. I have 2 new Bangel kittens, I am new to the bangle world. But I find it odd that the 2 half brothers want to poop together & then play in there poop box. It started the very day we brought them home. I have a litter box for each kitten & clean it out 2 to 3 times a day. I have never had a kitten or cat do this ever, so I spend even more time cleaning up after them. One is very sweet & the other is very stand off ish.I have a very clean house. They have not had an accident outside of the box. But haul & walk with poop on them. I bought them from a good cattery. What can I do ? They are 11 weeks old now. I play with them till there tired & they do sleep all night. But the poop thing is not good. This is a little strange, though it could be a comfort thing, Christina. I am assuming you’ve not had them long. Hopefully they will grow out of it soon. We have heard lots of cases of cats playing in fresh litter, but not pooped litter. If you see them do it, don’t shout at them, gently say ‘no’ and move them away from the litter box. Hello Tracy. This clearly sounds like it is aimed at wanting food, and the more often he gets food when he does this, the more he will do it. So you need to break the habit. You could try leaving a supply of biscuits down all the time for him to eat? He may appear to gorge on them to start with, but once he knows they are there whenever he wants them, he will regulate his eating more. And the other side of this is to not give him what he wants when he does this, say “no” in a firm voice (though don’t shout) and ignore him. He should learn then that he is not getting the attention that he’s after. Hello fellow Bengal lovers! I am getting a 14 week old Bengal kitten in the new year. I am very excited to have a companion as I live alone, 2 hours drive away from family. I plan on keeping her indoors and have ordered cat trees etc. My only worry is when I come down at weekends to see my sisters/mum/dad will she be able to come with me? I thought that because they are intelligent and because I am keeping her inside this wouldn’t be a problem but a conversation with another cat owner has made me worry about this 🙁 I am buying her for company but I will only be lonely if i am not able to visit family. Please help if you can. Hi Jade! There is no reason why you couldn’t do this. If you get her used to it at an early age and it is safe and escape-proof at your family’s homes then we would say go for it! 🙂 We regularly travel with our Bengals on 2 hour+ trips when they go to cat shows. They behave impeccably. Hey there spot, this is Kyle and Cash. We’ve been very busy lately. Glad to see y’all are doing well. Hey Jade Borland, mine also travels with me all the time, wether it’s going to the store or going on long vacations he is ready to go, he loves riding in my truck. He’s been to orange beach, New Orleans, Houston, Dallas, Florida, and Arkansas. My Bengal doesn’t like pet carriers, but he is happy in the dash of the truck or in the back window or laid out in the passenger seat sleeping. I started mine riding in the truck from the time I picked him up from the breeder and now he is 3 years old. I keep food and water in my truck at all times and I have a small travel litter box that I put in my truck when he comes with me. Take your time with your critter and I hope you enjoy your Bengal. They are really fun cats and they are nothing like any normal cat. They act more like a dog than a cat. We bought a 16 week old Bengal boy a couple of weeks ago and he is perfect except for his eating. He refuses to eat the food the breeder sent, he refuses to eat dried food (best quality at 80%). All he will eat is raw chicken and sometimes pilchards. He turns his nose up at raw liver kidney heart and beef. He will eat a very expensive complimentary food. I’m worried that his diet isn’t varied enough. He will go hours without food rather than eat his dried fwhichood is kitten specific. He drinks regularly and sleeps for long periods inbetween periods of manic play! Any suggestions would be great. Did he eat ok at the breeder’s house? Is the expensive complimentary food also chicken? If so, perhaps he just prefers chicken. You can buy pre-prepared raw food that has all the nutrients they need – you can buy it online from sites such as Natural Instinct. We hope that helps. Hi Pop! We don’t really agree with the soft claws as it’s in a cat’s nature to scratch and if you prevent them, it can stress them out. You need to make sure there are plenty of places for your cat to scratch where it is allowed – cat scratchers and posts etc. If your cat is young, it should be no problem to train them. If you find they are scratching in areas they shouldn’t, pop a scratching post there with enticing catnip and reward your cat when they use it, then you can gradually move it away if you don’t want it there permanently. Trimming claws will help too, and again getting your kitty used to this when they are young is usually helpful as they get older. Hello! My bengal is 2 years old and a girl 🙂 We had problems with aggression about a year ago. We got her fixed and a new playmate to try to help. She went back to normal almost immediately! Now it’s almost a year later and she has started hissing and swatting at him all the time. Our new cat was a kitten when we got him so she grew up taking care of him, cuddling him and sleeping together. But now if he tries to do any of those things with her, she gets very angry at him. I just don’t understand…Only think I can think of is now he has gained a little more weight then she has and is bigger then her. Could that be the issue or is there something else it could be? He is also fixed by the way. I forgot to mention that they still play at times, but it’s more rough then it use to be since she has started rejecting his company. It’s more of the cuddly, cute things that they use to do together that she now won’t do. He still tries daily to get her to let them do comforting things together, but she completely rejects him. Hmmm.. could be a size thing. Maybe when they have played rough, he has inadvertently hurt her and this is why she’s rejecting him. It’s impossible to be sure without seeing them. We suggest trying something like Feliway or maybe even consulting a pet behaviour expert. Hi! I have just put deposit down for female bengal. After a few months I will go pick her up and introduce her to my home. I have read several of the tips above. However, I am mainly worried about the excessive meowing. What steps should I take to make this transition comfortable for her? Same food, litter, water, blankets, toys. Should I confine her to my bedroom so she isn’t alone? or another room to herself? Hi Greg! A lot will depend on the cat. If you allow her into your room now, you have to know that she’ll probably want to carry on being in there so if you’re ok with that, go ahead 🙂 Bengals can be vocal but not all necessarily are, so you may wish to just take it as it comes and see how she gets on. If you can consider another kitten, this is often a good option. 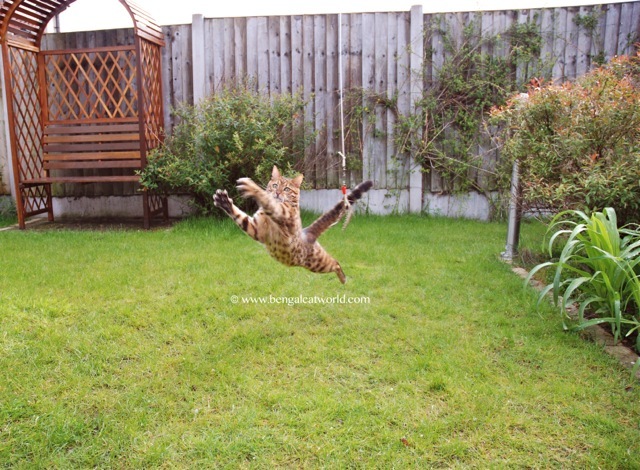 Doesn’t necessarily have to be a Bengal, but a reasonably lively cat. I just bought a 1yr. Old bengal. And he is biting me and mean since is been only 2 days. I need advise how can I make him like us. He needs time to settle in, Ruth. 2 days is not a long time at all, cats are very territorial and he’s not yet settled into his new territory. You need patience. When he does bite, say “no” in a firm but not shouting voice, and then ignore him. He should learn that it’s not the right thing to do. Good luck! Hello there. I am very grateful that I have come across your forum. I just became mama to my bengal boy, I have waited 2 years for him! The breeder I purchased him from is reputable and has been breeding for years however she lets her babies go at 10 weeks. Now I have him home and he hasn’t eaten for over 24hrs or drank anything. He has peed twice of course not in his tray. He has moments of exteme anxiety and shaking but I can calm him down. I just hold him and talk to him. I can’t bring him back to the breeder for I drove 16hrs to pick up..I feel like he has been taken from home far too early. I don’t want to lose him and I need to know what to do to get him to eat. I have the same food the breeder had him on and have spent the day in my bathroom floor loving him. I have my bengal named as kitcat. About 1 -2 months old. Please help me to potty train him. He pisses all around my bedroom. I got him from a street in kolkata. He was all wet in night rain and was about to be attacked by stray dogs. I braught him home. He drinks little cow milk. Eats whiskers ( tuna). And even fried chicken smashed. He sometimes sleep with me and sometimes in his house ( a carton box with clothes in it). Bis favourite sleeping place is beside my tummy and on chest. His eliminates in diffrent corners of my bed room. And as u knw it smells bad. Hi Akhil. First of all, don’t feed him cows milk as it can upset his tummy, water is fine. Have you got litter boxes for him? He will not know what they are if he’s been on the streets, so you need to show him the litter box. Put the box in the places where he eliminates and gently place him in it from time to time. He should get the message. Never shout at him if he makes a mistake as that will just stress him more, and give him lots of praise when he does use the box. I have a Bengal kitten called Casper and she’s an orphan. I don’t know how old she is and I think she’s a Bengal. She is quite skinny and weak. Unfortunately we are on a holiday here in Pakistan for a few years and there are no vets or pet store in Pakistan. I really need help Coz I don’t know what to do with her. And my family don’t like her as well. My grandmother kicked her soo bad they her paw started bleeding and I also have a new brother so we’re all scared for my bro’s safety so now she lives with our next door neighbours. Plz plz plz give me some advice on how to look after her. Keep her away from your family to start with being as they dislike her so much. Your neighbours need to give her lots of care and tlc. Give her whatever meat you can if there are no pet stores to buy proper cat food from. Make sure she drinks lots of water. Hi there! I’m really hoping you can help. We have a Bengal / Shorthair cross. She’s the most lovely and affectionate cat imaginable. (Loves head butts!) Sadly, ever since she was spayed we have had issues with her spraying everywhere and on everything – even us, while in bed asleep! It seems like she’s throwing a tantrum, like if she doesn’t get what she wants, she looks you straight in the eye and then spays on the sofa, the tv, the pc, he laundry basket, the walls, the doors, you name it. Hi Karen. Sorry to hear this. It sounds like you’ve taken lots of the right steps already – getting her checked out by the vet and using Feliway. It may be worth trying a tablet called Zylkene. This is not a drug, it’s based on natural by-products from milk. Milk is said to be soothing as of course that’s what we all drink when babies. You can buy it online, but we’d recommend you discuss this option with your vet. The other suggestion is to consult a pet behaviourist – again your vet should be able to recommend one for you. Just looking for some advice. Our 2 year old bengal Chuck has been outside during the day for the last 12 mths. He always comes home for dinner and is never out at night. Recently however we have had reports from our lovely neighbours that Chuck is attacking their kitty Monty. I am devastated for the other cat and his family family (Monty is 14yo). He has also bought home rats and mice (which i thought reasonably normal) but today he bought me a rabbit! Is this behaviour reversable? Managable even? Especially towards our neighbours cat? Or is taking away his outside priveledges the only option? Any advice appreciated. I want to do whats best for Chuck and Monte and the local wildlife. Yes he is neutered. Still quite the handful though. Seems to be getting worse as well. Is there a point (age wise) that they begin to relax a bit? Every cat is different but generally the older they get, the more relaxed they get. It’s hard to put a specific age on it though. Hi all, I am going to view a snow Bengal on the weekend. She’s beautiful and has blue eyes. She is 100% Bengal according to her breeder and both parents can be seen although she is not registered – should I be concerned? We would not recommend buying any pedigree cat from an unregistered breeder, Amie. Unregistered breeders do not usually have as much care in their breeding, few (if any) do regular health checks of their queens and studs. Some are in it just to make money with little thought to welfare. Of course, not all are like that but you pay more from Registered breeders for very good reasons. Hello, just looking for some advice on getting a Bengal kitten. I am part of a family of 5, plus two cats (mother and her son) who have been with us for over ten years and mean the world to us. I have wanted to get a Bengal for many years now, and we now have the opportunity to own a kitten when she is ready to be taken away from her mum in the next few weeks. I have read on many websites about how to integrate a new kitten into a household with resident cats, and the kitten’s main room will be my bedroom (the attic room) until we can introduce her to the other cats and the rest of the house and garden. However as my house is quite large and consists of three floors, would you recommend only introducing the kitten to one floor at a time? Or maybe introducing some kind of stair gate for the first few months? Another concern I have is that as the kitten will be mainly staying in my room until she has acclimated, it is up to me to take care of her. I work night shifts on Wednesday to Friday nights, therefore I am out of the bedroom from 9pm to 8am, and from 8am to 3pm I will be asleep in the bedroom (just on those three days). The rest of the week I am in the bedroom nearly all day. Will this be a problem for the kitten, as I hear they need a lot of socialising? This will only be an issue until she can roam the entire house and be introduced to my other cats, as various family members are in the house all day. Sorry to write so much and thanks for your help! I forgot to add that I will have a cat crate in my bedroom too! Thank you Kyle! It’s lovely to hear from you again, we hope you and Cash are well. I have just brought our Bengal kitten home 5 days ago. She is in a bedroom and has explored the entire room, uses her litter box and eats and drinks. She will not let us near her…I have recently been able to sit around the room and have her come out of her hiding place but will not get too close to me. Last night during her meowing time I went into the room and attempted to sleep in the bed. She did climb up to be face to face with me but only hissed and then climbed back down. I have not been able to touch her since we brought her home. I think this is normal…it will take time. I wanted to let her out of the room so she could explore the rest of the apartment, but it is rather large and I worry if we let her out she may get lost and we’d never see her again! I’ll be getting a new Bengal kitten (mine died after 14 years). We go to my in-laws home very often, about every other weekend and stay two nights. They live an hour and half away. My first question is, do you think we can get our Bengal kitten used to traveling for that long and used to someone else’s house? My second question is, my brother in law often visits at the same time and has a boxer. The boxer is about 4 years old and used to live with a cat. Do you think the kitten could get used to him, even if he only sees him possibly every two weeks for two days only? Thanks so much for any help/advice you can give me! Hi Marcella! As with most cats, if you introduce new experiences to them when they’re young, they usually are quite adaptable 🙂 In terms of the travelling, I don’t think that will be an issue as long as you have a large, comfortable and secure carrier, our Bengals regularly travel all over the country to cat shows and are very good, though they have done so since they were kittens. As for getting used to another home, again it shouldn’t be a problem if they’re used to it from a young age. And finally, we hear of lots of examples where Bengals get along with dogs very well, so as long as they’re supervised, I think it should be ok though of course let them each have their own space as and when they need it. so many stories about unhappy bengal kittens being removed from their litters too early! Just think of them as babies or toddlers who have had such a major upset – and treat them with the patience and kindness they need! As for being vocal early in the morning – you may just have to roll with it! – My two are now 3 years old and have made me into a ‘morning’ person! – I never used to enjoy the dawn and calm early in the morning before – now I love it! And if you have space, a cat enclosure/ run would be good on the ‘savings’ list – one of mine spends all day sitting in the run waiting for lizards who are stupid enough to enter! Please be patient with them. It is not their fault that they are unhappy and they are only trying to tell you that they are. . . but they will settle with consistency, certainty and care. Hi, we have a 15 week old Bengal girl. We have had her for 3 weeks. She has settled in and is using her litter box after a few accidents. She is very playful and active. The problem is that her stools are quite soft and there was some blood and mucus in it. We took her to the vet who gave her antibiotics for a week and also Panacur for worms just in case. The stools did not improve much and now she has finished them there is blood and mucus again. She is on Royal Canin kitten dried food and eating and drinking well. She does not seem ill and is gaining weight. She does not have diarrhoea as she goes once sometimes twice a day. Any ideas what is causing it? Has anyone else had this problem? Thanks. I would take her back to the vet, blood in the stool is not a sign of a happy kitty. Our bengal had a little episode of this when he was a kitten and eventually we changed his food over to Royal Canin Gastro Intestinal and it completely solved the problems. Seems he just had a sensitive tummy, which seems common for Bengals. (he is now on the light calorie version which he loves too). Thanks for the reply, we spoke to the vet and she recommended Royal Canin Sensitivity pouches which we are currently trying and there is a little improvement after 3 days but still wet at the end. Will speak to vet again tomorrow. Can anyone give me advice on what food to give my 17 week old kitten? Royal Canin kitten biscuits do not suit her neither does Felix wet food. I would like to giv her wet and dry if possible. It is not good to change the food too often as this can cause tummy upsets all by itself. We feed Royal Canin and it is a great food, but perhaps there is a different variant of it you can try. Soft stools are quite common in kittens though the blood/mucus is more of a worry. We recommend you keep up the visits to your vet and if they’re not getting to the bottom of it (‘scuse the pun) perhaps take her elsewhere for another opinion. Remember, some things can take a while to work, you won’t necessarily see improvements after only two or three days. If she is fit and healthy in all other respects, then I wouldn’t chop and change too much, What did your breeder feed? Did she/he have the same issues? Are you feeding other things such as little treats that may be the underlying cause? Hi Spot, no, the breeder did not have problems and was feeding Felix and Royal Canin biscuits. The vet advised us to stop the Felix which we did put the problem persisted so they gave us the Royal Canin sensitivity pouches which worked to some extent but they said Rosie could not stay on them as it is not a kitten food so we gradually introduced James Wellbeloved grain free kitten pouches which produced solid stools immediately for 3 days and they we were back to solid and soft! So frustrating, I thought we had found the answer. Will talk to the vet again. I have just purchased a new bengal kitten. I got him from one of the best breeders here in Brazil. He is arriving in January and will be 16 weeks by then! This will be my first cat so I’ve been reading and researching a lot. I want him to find a comfortable and safe place for him to live in. I’m also wondering what the best adaptation strategy should be. During the first weeks, we plan to leave him in the balcony during the day while we are at work (we have quite a large balcony and windows are all protected) , where he would have plenty of room, outside view, litter box, cat tree and toys to play with. Would that be better then leaving him in a bedroom? When we get home, of course we will spend tons of time with him. Should we introduce him to the rest of the house right away or leave him in the same place until he is fully adapted? Also at night, should we leave him in our bedroom with the doors closed? I’m not sure wether it would be good to leave him alone during the night. We wouldn’t mind him sleeping with us. Tks and congrats on the awesome blog. Hi, we have acquired a 3 year old bengal. We absolutely love her and made the house welcome for her and have no problem with her. We love her and she loves us. Just a curious situation, we feed her dry food, a good recommended one and the one that came from her old home, and she loves it although she will crunch on it and eat but will not eat the broken pieces after the first crunch So with that she always wants more but still has half of what was in her bowl. She only likes the whole pieces. I really don’t want to have to do any kind of wet food as she seems to really like her dry food, no need to change, but she only will crunch on the whole pieces. I am literally throwing out half her food. Hi, I’d just like to say we’ve added a beautiful snow bengal kitten into our family and even though she’s only 10 weeks old within 2 days of being with us she seems to be settling down really well. She has taken to a litter tray instantly and is eating whiskas meats and whiskas dry biscuits and drinking water. I’ve noticed she is a hyper and vocal little lady who is already happy to be stroked and played with. My only gripe is she goes under the sofa for a sleep and recharge her batteries about 9pm then about 2am she goes mental. The Xmas tree is slowly being taken apart, she’s running around like something mental and really does disturb our sleep. Anyone got any ideas although I’m guessing it’s a kittens nature but at 2am it drives us mad lol. After my dear Blue Russian died of cancer, I acquired a 9 mth old silver bengal boy. How long before he becomes tame? He is friendly but very timid! He stays in my second bedroom and will not venture into adjoining rooms-possibly because of my previous cat’s smell? I need to clip his claws and try a harness on him but he spooks every time I try to get close? How long before I can handle him safely? I’m about to own two bengal male kittens. So far I’ve read that kittens especially bengal kittens do well with some company especially if the owner is gone for most of the day, which would be my case because of work. Do you have any suggestions for like a starters kit of stuff that I would need for my bengals? You know like the essentials: food, cat litter, etc. Also do you have any recommendations on a cat tree that is relatively affordable? I’ve been looking on Amazon and most of them go quite high but I have read that bengals love to climb on high places so how high should I get it? And any other suggestions you could have about owning a bengal would be much appreciated. Hello! I just picked up my first bengal kitten yesterday. He is so sweet but also so scared! It seems to be quite normal, as I have read the comments above with people having a similar issue. He hides a lot under tables and seems very scared and shakes quite a bit, but I am able to get him to calm down by holding him and petting him. Do you think he was not socialized enough? He is 12 weeks old. What can I do to help him if he was not played with enough in his first 12 weeks? We have recently purchased a Female Bengal. She is nearly 9 months old and had been living with her brother and several other Bengals for the entire time. The breeder actually runs this business from her home. She disappeared for 2 days but we finally found her hiding in such a tiny almost inaccessible corner under our daughters bed. She would not come out. We saw that she was coming out to eat and she also used her litter but never when we were awake or around. It has been one week now but she still will not come out of hiding? Do you have any guidance you can give us. Our two little girls are so sad and we’re so looking forward to playing with her. Can you please give us some guidance? Should we just wait it out? Are there things we could possibly do to encourage her to come out. I’m very pleased to find your site as it seems I have acquired a Bengal mix. If the stories are correct I am is 3rd home in probably less than a year. This is judging by the size he was and the size is growing into, he’s still a young cat. He was neutered and front claws removed before he came to me. I have two other male cats as well, both younger (2-3 yrs old), neutered, house broke generally good cats. Did a almost month long slow introduction for the three of them. First, he doesn’t seem to know how to play with other cats. This he is picking up, but still really just doesn’t get the race around and tumble games, he tries, they try, but it is still an ongoing learning process for them. Second, from what I can read on it, he has ‘frustration peeing’ . We will play, he gets all excited and wants more and more, if I have to stop for a moment, he pees on the sofa or bed, whichever one we were closest to at the time. This is the habit I need to break. I have bought numbers of toys, all sorts of different types to allow him to learn. His favorite is human hand. While is gentle with it, he sometimes over stimulates and goes a little wild. This is most likely to be when the peeing happens. This behavior is triggering my Russian Blue into spraying walls. Needless to say, I would like to stop this before it gets any further out of hand. They are all good cats, but I am not fond of kitty wee on things. Any suggestions? I will soon be getting a male Bengal kitten at 8 weeks. A concern is having it in a home with pet finches in a cage. I am optimistic the cat being a kitten will allow for training it to love cohesively with birds in the environment. There is also a small 20 lb male dog which I am hoping will become good pals and help entertain the Bengal throughout the day. Is this in any realm of possibility. In addition, how often do bengals tear into house plants? Can this also be implemented into training. Any other suggestions for a new kitten? I have been doing my best to research and find reliable information. I would like you to clarify what vaccinations are needed overall and with what schedule. I appreciate your time and comprehension. I was hoping you might have some advice/tips. We have two bengals, aged 17 weeks, we got them 4 weeks ago. They came toilet trained, but we’ve been having problems with one of them. We have a litter tray downstairs and upstairs. She seems to use the one downstairs no problem, but seems to struggle with toileting upstairs, despite us showing her the tray and her playing in/near it. Just this morning, she peed on our bed covers and as we were changing them she pooed on the actual bed, we had similar problems last week as well. Not really sure what to do, so some help would be appreciated. Thanks!! Your bengals got separated very young, most go at 10/12 weeks after injections. Does your cat give any signs it may need the litter tray? Meowing? Digging? If so place her/him straight in the litter tray. Are you using the same litter that the breeder was? Also is the litter tray always clean? Bengals are very clean cats and I know mine doesn’t like going in it if a wee or poo is left in. Perhaps try the litter tray in a different place, ensure it is away from food and loud noises. If the cat has had a scary incident(eg loud noise) near the litter tray it may not go back in. Perhaps try a different litter tray? The breed seems to like tall litter trays, mine loves the litter trays with a cat flap so she is completely hidden inside it. Hope he/she starts using it! We just adopted a 20 week male bengal kitten, Theo and he is adapting well to our home however we notice that he enjoys sleeping in my daughters’ bed instead of in his pet bed at night. My daughter cannot get a good nights sleep as it is a single bed and doesn’t have a lot of space for him. Is there a way to train him to sleep on his own bed? It is only the 3rd night with us. Also, he doesn’t want to go to sleep when we go to bed and wanders around on his own. My daughter leaves her bedroom door open so he goes in when he is ready to sleep. Also Theo seems to run, jump and grab the door posts – should we stop him from doing this? We believe this is how he burns off his energy…..
Any suggestions for these 2 questions are welcome. My Bengal is 13 weeks old and I have had her a week, she is beautiful and perfect. I just have one problem, she has hundreds of toys; balls, fishing rod toys, mice, lasers, scratching posts, yet she still seems as if she is bored? She keeps clawing our sofa and chairs and climbing up the curtains, me and my partner work full time so god knows what she gets up to in the day but we never come home to any damage I think she sleeps all day. But in the evenings and weekends she has mad moments where she runs about like crazy and just claws everything! We play with her for about half an hour before we go to work and all evening when we come home from work and lots through out the day at weekends. I just don’t know how to get her to stop? Any suggestions? Thank you for your order from our store – the Dragonfly toy is fabulous, I’m sure your babies will love it!